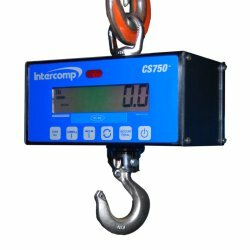 Intercomp CS-750 crane scale with 500 lb capacity is a high accuracy compact digital hanging scale for low capacity industrial applications. Other capacities for the CS750 run from 25 pounds up to 1000 pounds. The scale features a high visiblity 1 inch Liquid Crystal Display (LCD) with backlight and will operate for up to one year on (6) D batteries. Crosby eyehook and bottom swivel hook are standard. Full featured infrared remote control is included with item.